Tensions have been high at the Afghan-Pakistan border crossing over Pakistani visa requirements. Armed personnel with the Afghan Border Police and Pakistan’s Frontier Corps exchanged fire at the border crossing at Torkham late Sunday. Tensions at the crossing have been high since Pakistani authorities implemented stringent visa requirements and clamped down on Afghan entry to Pakistan. According to Afghan news agencies, violence erupted on Sunday over the “installation of a gate by Pakistan.” Though information remains limited, Afghan news agencies in the area report no casualties on either side. Dunya News reports that the violence may also have started over Pakistan’s interest in constructing an overhead bridge on the border. Torkham is one of the main border crossings between Afghanistan and Pakistan, located on their porous Durand Line border. The crossing connects the Afghan province of Nangarhar with Pakistan’s Khyber Agency. 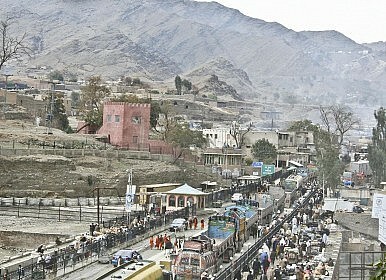 Torkham is the busiest official border cross between the two countries and serves as a major conduit for trade as well. 15,000 Afghan use the crossing every day and, starting in May, have been required to apply for expensive visas to cross the border. Afghan authorities see the Pakistani restrictions as a unilateral move to inconvenience Afghan travelers, many of whom regularly cross the border for daily commutes and to visit relatives. There is a broader political context to the tensions as well. Afghan authorities, including President Ashraf Ghani, have accused Pakistan of inadequately reining in militants from the crossing the border. Afghan officials perceive the Torkham immigration crackdown as a retaliatory measure. Pakistan, meanwhile, saw the late-May U.S. drone strike in Balochistan against Mullah Akhtar Mansour as a product of Afghan espionage and interference on its territory. Officially, Pakistan claims that the increased border controls at Torkham are to crack down on smuggling and militant activity across the border. One Afghan soldier and one Pakistani officer have been killed and 22 wounded in clashes at Torkham Border crossing.